A lot of the time, when I’m talking about bathroom design, style has to take something of a back seat to functionality. After all, bathrooms get used probably more than any other area of the home, day in and day out, and so making them comfortable and usable really ought to be the primary concern. But guest bathrooms are a different matter – because they aren’t used as rigorously, guest bathrooms are the one place where you can go a little wild with your design. 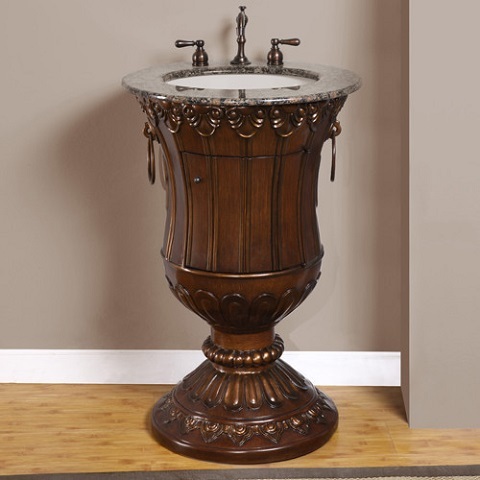 Personally, I love a guest bathroom that’s dressed to impress, and these beautiful, ornate pedestal vanities are sure to catch your visitors’ eyes. I make the distinction between pedestal vanities and pedestal sinks because the term “pedestal sink” has come to mean something rather specific. With a few exceptions, if you’re talking about pedestal sinks, you’re talking about the white porcelain, flat topped, freestanding sinks with column style bases. These have been popular since at least the Edwardian period, and are still a go-to choice for cottage style bathrooms. But while pedestal sinks are prized for the simplicity of their design, the pedestal vanities I’m talking about are exactly the opposite. 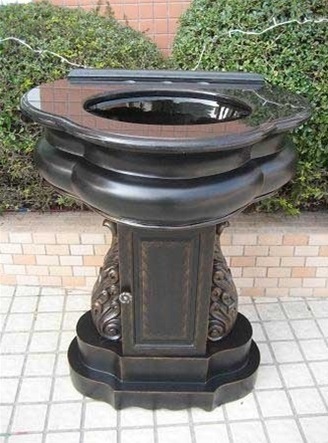 Though they bear some resemblance – a sink on a pedestal – these are made of more luxurious materials, like stone, wood, metal, or more colorful ceramic carved into beautiful, intricate designs. The actual sinks are also often a separate piece rather than an integrated part of the vanity. 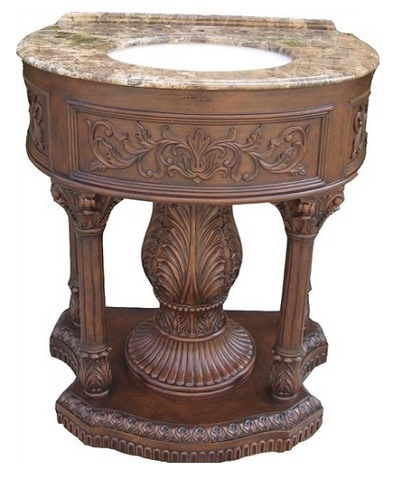 While traditional pedestal sinks are designed to create a spare, simple, clean aesthetic, ornate pedestal vanities are meant to attract attention rather than blend in. As impractical as these beautifully carved vanities might seem in just about every other way, they do have one very useful feature: they’re small, usually at least as small or smaller than even the most compact bathroom vanities – particularly some of the more ornate metal designs. That means they’ll fit comfortably even in a very small space like a guest bathroom. And it’s important to remember that the width listed for this style vanity is the width of the widest point – usually from one end of the vanity top to the other. But the curved, in-the-round carvings on the base are often actually much slimmer, which can make a small, enclosed guest bathroom seem larger and more open – and can even make a very small space a little easier to navigate. Another great thing about decorating a guest bathroom is something that’s typically a drawback in any other type of bathroom: there isn’t a whole lot of space to work with. 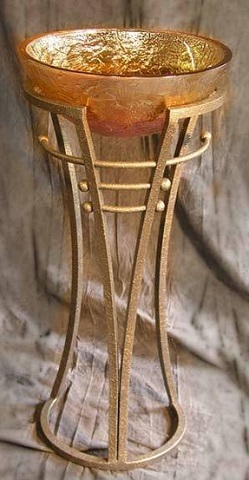 But what that means practically is that it doesn’t take much to get a really opulent look and feel. An ornate pedestal vanity will be the focal point of the room by default, and with a truly intricate, unique design, you won’t have to do a lot of legwork to make even a compact guest bathroom feel elegant and sophisticated. Plus, because the space is smaller, if you really do want to go all out – stone floors, stone wall tile, expensive window dressings, and so on – there’s so little ground to cover that it can be much, much more financially doable than it would be in a larger space. Of course, even the most posh, elegant, sophisticated guest bathroom is still a bathroom, with all the mundane realities that come with it. While guest bathrooms aren’t the storage center of the whole home, if you do use yours to store cleaning products, or if you just want a discreet place to leave a spare roll of TP or some tissues, you might be put off by some of the more sculptural of these pedestal vanities. That said, there are some models that are slightly more cabinet than curiosity. These keep their slim profile, but have small hidden doors that open to the hollow interior of the pedestal to provide just that little bit of storage. I wouldn’t particularly recommend even these for a workhorse, primary bathroom, but to ferret away a spare roll or a stash of spare bars of soap, these will do the trick without sacrificing much in the way of their decadent appearance. Guest bathrooms offer a great opportunity to get creative with your design, and ornate pedestal vanities are one of the best ways to make the most of that chance in a room where space is limited. 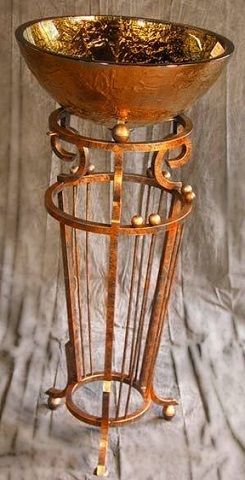 This entry was posted in Bathroom, Bathroom Vanities and tagged Antique Bathroom Vanities, guest bathroom, guest bathroom vanities, ornate pedestal vanities, pedestal sinks, pedestal vanities, Small bathroom vanities.